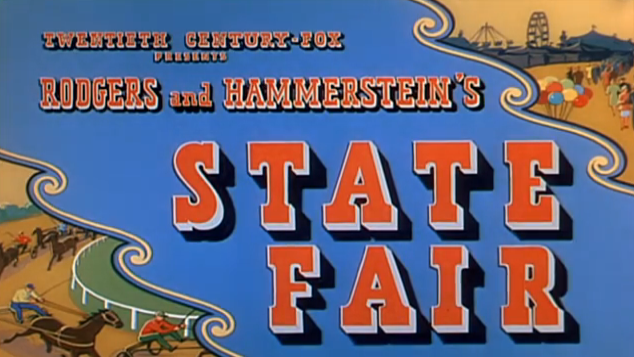 It was called “State Fair,” as a novel, a movie, two Hollywood musicals and several stage productions. On radio, it had at least a half-dozen adaptations. The whole theatrical Lockhart family was unleashed on this New Year’s Eve broadcast by Screen Guild on the Air in 1950. Daughter June and parents Kathleen and Gene play the Iowa farm family en route to the State Fair with Pa’s pig and Ma’s pickles. In this broadcast, 18-year-old Margie and the reporter she meets at the State Fair are the heart of the story. Who better for a model of worldliness than this newspaperman? He’s worked in New York and Chicago. He’s been to Paris. He’s been to Rome. He’s even been to her home town once — but only because a plane crashed there. lyrics Oscar Hammerstein II. The most famous songs from the show are “It Might as Well Be Spring” and “It’s a Grand Night For Singing,” neither of which is particularly journalistic. Hollywood gave the reporter role to Dana Andrews in 1945 and Bobby Darin in 1962, although the latter production shifted the star focus from the farmer’s daughter and the reporter to the farmer’s son, played by Pat Boone, and his romance with an entertainer, played by Ann-Margret. Radio versions of the musical, tracked down with RadioGoldIndex, include an early production from Lux Radio Theatre, on June 24, 1946 and multiple versions years later on The Railroad Hour. 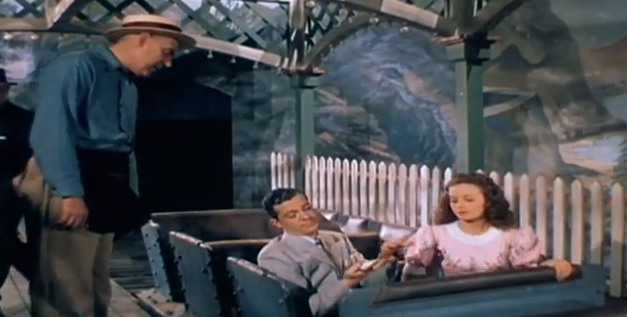 “The Railroad Hour,” which specialized in half-hour summaries of Hollywood musicals, did State Fair three times, starting in 1949, although that production is not in any of the popular online archives. The two later versions are available, from 1951 and 1953. In these adaptations the reporter is the lead character and gets to do more singing, played by series host Gordon MacCrea. The tension is between his hopes for a bigger out-of-town job and his sudden feelings for Margie. In MacCrea’s versions of “State Fair,” the journalist is, in his words, “Just a reporter for the local paper, but I’ll be a columnist someday” — quite a contrast with the older, world-travelled scribe of the Theater Guild productions. The story was also told with Ann Blyth as its star twice — first on Hallmark Playhouse on August 26, 1948, although the well-researched Digital Deli Too log of the Hallmark program lists the episode as unavailable in radio collections. Blyth was back with a General Electric Theater version, State Fair broadcast Sept. 10, 1953. Blyth is both star and narrator of the latter program, which has a mature script by Kathleen Hite, a radio and television writer who showed a flair for journalist characters in several series, including “Rogers of the Gazette.” Her “State Fair” ending is more subtle and “writerly” than the others.